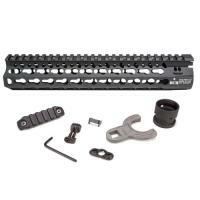 Bravo Company USA KMR-A10-556-BLK KMR KeyMod Rail Alpha 10" Handguard FREE SHIPPING! The KeyMod interface system was developed by Eric Kincel (now the Director of BCMs' product development team) to work in parallel with the current picatinny system. In many applications it will advance modularity past the current 1913 rail system. In the most basic of applications the KeyMod system allows for universal modularity between various manufacturers of accessories, and accessory rails. A big win for the trigger puller. As the industry advances the modular accessories will mount directly to the KeyMod instead of picatinny, allowing for a lighter, cleaner, and less bulky weapon system. *Includes BCM® KeyMod Sling Mount . ©2002-2019 CopsPlus.com: Bravo Company USA KMR-A10-556-BLK KMR KeyMod Rail Alpha 10" Handguard FREE SHIPPING!